The Goal of this Annual Meeting is to provide the healthcare provider with the ability to recognize, intervene and prevent intentional and unintentional harm to children from a variety of settings. It also provides unbiased "facts" regarding issues that face the physical and psychological wellbeing of our pediatric population today and preventive and intervening methods of "treatment. This activity is intended for physicians, physician assistants, nurses and other health care providers involved in pediatric care. Download the full accreditation statement for the learning objectives, credits awarded, and faculty disclosures. Preregistered guests can check in anytime the Registration Counter is open. New registrations may also be completed at the Registration Counter. Attendees must wear a name badge at all times during the conference sessions. Registered partners may setup their booths in the Exhibit Hall beginning at 8:00am. All setup must be complete before 2:30pm. Residents registered for the Pediatric Resident Forum Track may setup their posters, eat lunch, and network with one another during this time. All residents selected to present an abstract will be assigned a time during which to present their posters to the judges. Get advice from industry experts to help you prepare for your career in pediatrics. Stations will include: •	Dr. Gene Hershorin: Learn how to find a job after residency, including the preparations that should be made during residency, tips for interviewing, and what should be included in an employment contract. •	Dr. Tommy Schechtman: Private pediatric practice, the challenges and rewards of navigating the changing healthcare landscape of 2019. Dr. Schechtman will discuss how to implement practice strategies that will promote professional success and personal fulfillment. •	Dr. Lela Hobby: In-office stretch & breathing practice. Learn to find calm during your hectic day with simple 5-minute practices. The quality of breath is a barometer for the nervous system. Unconsciously, work-related stress may lead to shallow tense breathing & a feeling of strain. Deep diaphragmatic breathing, with simple in-office stretches, trigger a calming effect that can break this internal distress cycle. •	Mr. Chip Hart : Learn what is involved in setting up and running a successful, independent practice, and the steps that can be taken after residency to be your own boss. •	Mrs. Alyssa Greenstein: Learn simple ways to eat healthy, even on your busiest days in the clinic. •	Dr. Lisa Gwynn: Telehealth is an innovative tool that is improving the health of children around the world. This session will discuss the use of telemedicine technologies by pediatricians and specialists to deliver inpatient and outpatient care, as well as interacting with patients remotely. •	Mr. Doug Bell: Learn how pediatricians can positively impact children's health through the state legislative process. •	Dr. Paul Robinson: Learn how to develop leadership skills and get involved in improving the practice of pediatrics outside of clinical practice. •	Mr. Matthew Davis: Learn about the fundamentals of what a Resident can do set up for a lifetime of financial success, starting with what steps he/she can take in residency. The transition into an attending salary can be overwhelming with countless short term goals, student loan debt, and the large annual bill to Uncle Sam! Let’s develop a focus! •	Dr. Madeline Joseph: Learn about a variety of topics including pediatric emergency medicine, career plans, and balancing work-family life. Refresh with a coffee or snack while catching up with colleagues and visiting with representatives from the 2019 partners who make the conference possible. Students registered for and presenting a poster during the Pediatric Medical Student Research Forum may setup their posters after checking in before the start of the Family Reception. Poster judges will gather to finalize the scores from the resident poster presentations and select the winners of the 2019 Pediatric Resident Forum abstract presentations. Enjoy a snack while networking with colleagues and interacting with representatives of the partners who make the conference possible. Enjoy refreshments while networking with colleagues, meeting representatives of the 2019 partners, and mingling with family and friends before the start of the final round of the 2019 Brain Bowl. Colleagues, friends, and families will gather to cheer their alma mater or favorite residency program to victory in the highly competitive 60-minute Final Round of the 2019 Brain Bowl competition. The winning program will walk away with the coveted title of Statewide Brain Bowl Champion! Awards from the 2019 resident abstract presentations will be presented before the final round. Attendees and their families are invited to enjoy entertainment while networking with colleagues and friends following the naming of the 2019 Statewide Brain Bowl Champion. Purchase tickets for the 2019 Family Reception, "A Walk on the Boardwalk" to enjoy food, music, dancing, activities, and photo opportunities with Disney characters before heading out to view Epcot's firework show! Tickets are available for individual registrants ($30) or for families ($60 - 2 adults plus kids). Additional adult tickets can be purchased for only $30 each. Enjoy a hot breakfast while networking with colleagues and interacting with representatives of the 2019 partners. Start your morning right with guided stretching and basic yoga. Develop awareness of the calming effect of simultaneous stretching and breathing in a mindful practice. This 45-minute yoga practice will energize you for a day of sitting and learning. Practice will begin with a warmup, followed by slow sun salutations, a floor practice, and ending with a 3-minute ‘wakeful rest’ shavasana. This class is suitable for both novice and advanced practitioners. Active wear is not required, but you are encouraged to wear a comfortable shirt and pants. Students registered for and presenting a poster in the Pediatric Medical Student Research Forum who did not setup their posters on Friday, may setup their posters at this time. Students registered for and presenting orally in the Pediatric Medical Student Research Forum may setup their PowerPoint presentations during this time. After attending this session, participants will understand the issues affecting child health at a national level, and the initiatives the American Academy of Pediatrics is involved to address those issues. Healthcare is hard work and it is getting harder. This stress is unlike anything experienced before for physicians and healthcare workers. The key to being able to endure and be resilient is to know how to recharge, to refill your bucket so you are not always running on empty. This session will: * Describe initiatives to address the crisis of physician professional burnout; * Explain how the quality of care and patient safety are affected when a physician becomes disengaged; * Apply individual and practice strategies that can enhance resiliency and promote physician satisfaction and engagement. Enjoy a refreshment while networking with colleagues and partner representatives. Remember to take your Partner Punch Card to complete the challenge and be entered for the chance to win a prize at the end of the conference! Have your questions answered by the morning's presenters during this interactive panel discussion. So many articles, so little time. 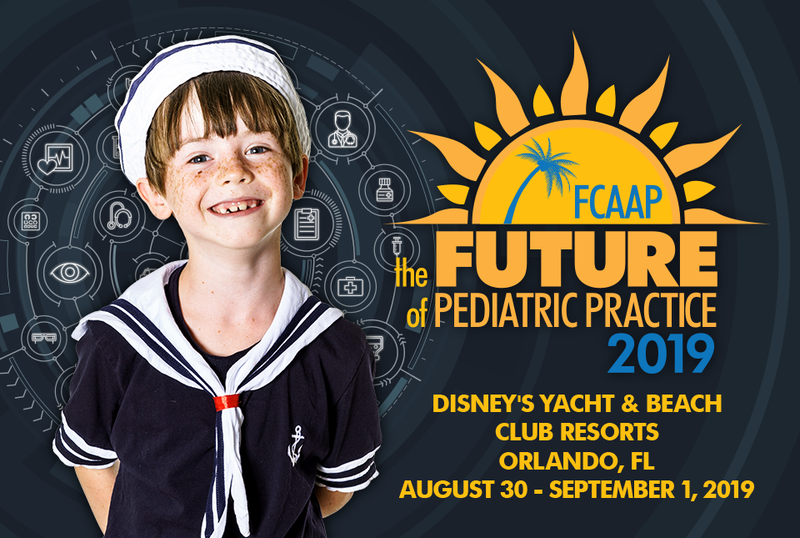 This session examines recent pediatric literature that may actually change your practice. In addition to an overview of the most important literature, a deeper dive into the research design and statistical analysis of some articles will provide a deeper and more nuanced understanding of the results, while simultaneously enhancing attendees’ critical appraisal skills. Learning objective: At the end of the session the learner will be able to list several potential practice changes based on recent literature. Enjoy a complimentary lunch while seeing a 30-minute product demo from one of the 2019 luncheon partners. Enjoy time to stretch your legs and network with colleagues and partner representatives after lunch before the afternoon sessions begin. Virtually all children experience the death of a friend of family member at some point in their childhood. Even though bereavement is a normative experience, a significant loss can have a significant impact on children’s psychological adjustment, academic achievement, and personal development. This presentation will provide insight into how children come to understand and adjust to a loss and practical suggestions on how adults can talk with children and provide needed support. By participating in the session, the learner will be able to: 1. Initiate conversations with children and their families related to deaths of family members and friends 2. Understand the role of guilt in impacting adjustment to a loss 3. Provide practical advice on issues such as funeral attendance of children and appreciate the importance of long-term follow-up after a significant loss. During this session, attendees will learn: * How to use your trusted, respected, and unacknowledged power as a pediatrician; * How to advocate for the child first in a non-partisan and evidence-based manner; * How to advocate at the local, regional, and national level; * How to utilize AAP guidance, support, and empowerment in advocacy efforts. Have your questions answered by the afternoon's presenters during this interactive panel discussion. 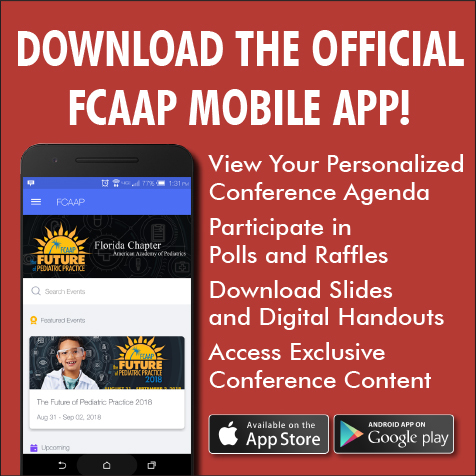 Exclusive meet-and-greet with the Board of Directors of the Florida Chapter of the American Academy of Pediatrics and the Florida Pediatric Foundation and representatives of the Presenting Partner, the Luncheon Partners, and the Family Reception Partners. By invitation only. Preregistered guests can check in anytime the Registration Counter is open. New registrations may also be completed at the Registration Counter. Attendees must wear a name badge at all times during the conference sessions. Registrants attending ONLY the Practice Administration Track may check-in as early as 12:30pm. Big Thunder Mountain - because primary care pediatrics is a wild ride! After attending this session, participants will * Be able to recognize the presentation of Anorexia Nervosa, Bulimia Nervosa, and Binge Eating Disorder in an office practice. * Understand management options for eating disorders in the pediatric office. Carousel of Progress - it's a great, big beautiful tomorrow on the wards! All pediatricians desire to provide high-value care to their patients, however, a limited evidence base, entrenched practices, and misaligned incentives often lead to low-value care. This talks provides an introduction to value in medicine and discusses overuse as a major driver of low-value care. Additionally lessons learned over 10 years in an AAP quality improvement network dedicated to decreasing overuse will be discussed. Learning objective: After attending the session learners will be able to define common terms in value-based care including high and low value care, over diagnosis, overuse, and value based purchasing. Weaponized Social Media - What You Don't Know Could Crush You! Have your questions answered by the morning's speakers during this interactive panel discussion. Have your questions answered by the morning's presenters with this interactive panel discussion. After attending this session, participants will * Understand the criteria for medical admission for eating disorders. * Understand inpatient management of eating disorders in a medical hospital. * Be able to avoid severe refeeding syndrome when managing severe malnutrition. Designed as a review of the most common neurosurgical issues seen by a pediatric provider, including the latest minimally invasive treatment options, this presentation will help the audience to: 1. Compare the clinical features of the different varieties of craniosynostosis and contrast with positional plagiocephaly; 2. Differentiate benign macrocrania from hydrocephalus; 3. Identify cutaneous signs that may signify an underlying tethered spinal cord. Have your questions answered by the afternoon's speakers during this interactive panel discussion. Attendees registered for the Practice Management Track will enjoy lunch and time to network with colleagues before the afternoon's sessions begin. The track's sessions include: Dr. Todd Wolynn Recruit, Engage and Retain patients How to effectively engage your community to attract like-minded patients to your practice, engage them in their care and participate in your programs, and ensure that they keep coming back to you. Mr. Chip Hart Lower Your Costs, Increase Your Revenues, Improve Productivity Running a small business isn't rocket science - money comes in, money goes out. Yet so many pediatric practices struggle to remain on solid financial ground. We will review the simplest and most common "practice management hacks" that strong pediatric practices use to be able to focus on their mission to keep kids healthy. Mrs. Susanne Madden Streamline Operations, Overhaul Processes, Effectively Manage Your Practice Little improvements accumulate to become efficiently running organizations. Assessing your operations and drilling down to root causes for poor performance can uncover big opportunities for change, and engage your staff in the process. Dr. Todd Wolynn, Mr. Chip Hart, & Mrs. Susanne Madden Ask The Experts! Get answers to your questions about running a successful and profitable independent practice from the industry's leading experts.